There are 4 forms of organ rejections. These include hyperacute rejection, acute rejection, chronic rejection and graft versus host disease. Hyperacute rejection occurs within minutes after the transplant of organ. Hyperacute rejection occur due to present of pre formed anti - donor antibodies in the blood circulation of the recipient. Hyperacute rejection is an irreversible condition with the present of fibrin platelet thrombi, infiltration of the neutrophil and necrosis and cyanosis of the graft. Acute rejection occur within weeks after the transplant of organ. Acute rejection occurs due to cytotoxic T cell reaction with class I major histocompatibility complex ( class I MHC). Acute rejection may present with thrombosis, necrotizing vasculitis, edematous and hemorrhagic interstitial infiltration of mononuclear and swollen of the endothelial cells. Acute rejection is treated with immunosuppression. Chronic rejection occurs within months and years after organ transplant. Chronic rejection occurs due to impairment in the effectiveness of the long term immunosuppressive therapy for vascular changes within the graft. Chronic rejection is an irreversible condition which atrophy and ischemic changes of the graft due to intimal fibrosis of the arteries. Graft versus host disease is an inflammatory reaction which affect the gastrointestinal tract, liver and immune system. It is associated with proliferation of grafted T cells in immunocompromised recipient which attack the recipient host cell. 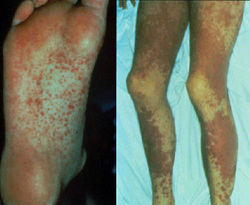 Patient with graft versus host disease may present with hepatosplenomegaly, diarrhea, maculopapular rash and jaundice. Cyclosporine is useful to reduce the disease. Monoclonal antibodies or anti thymocyte globulin is useful for the tissue donor.